Physocarpus opulifolius is a native North American plant. One of the more popular cultivars 'Diablo' or purple leaved eastern ninebark was actually developed in Germany, however. The deep purple leaves which are similar in shape to maple leaves contrast with clusters of pinkish-white flowers in June, followed by clusters of red seeds. The purple foliage also contrasts nicely with other plants in your garden. Planted as a specimen, physocarpus works well with the golden to chartreuse colors of the false cypress's of the genus, Chamaecyparis. 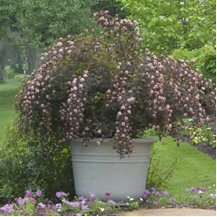 This deciduous shrub with multiple stems can grow to be ten feet high by ten feet wide. It is a rapid grower that prefers well drained acidic soil, but will grow under most conditions. Sunlight requirements are full sun but it will also do well in partial shade. As mentioned before, it is a native of North America. This plant has green leaves, but is otherwise similar in habit. The plants are hardy to USDA zone 2. If the purple-leaved variety is situated in the shade, the purple pigmentation wil fade somewhat. The nickname "Ninebark" refers to the way its bark peels back in layers revealing different shades of gray and brown. This makes the plant an ideal winter interest plant for your garden. Cutting the plant back too severely will lessen the effect since it is most apparent on older stems. Since the ninebark blooms on the prior year's wood, the plant can be kept in check by pruning after the blooms have died off. It can be cut back in the spring, even cutting it to the ground if you wish, but you will sacrifice the blooms for that year. A new variety that has a more compact form is 'Summer Wine' from Proven Winners. This variety, shown above, is about half the size of other ninebarks but has all of the other characteristics. The clusters of pinkish white flowers are even more apparent on this smaller plant. Ninebark is a relatively pest free plant and aside from the yearly pruning to maintain size if desired will make a maintenance free addition to your landscape as a specimen or container plant. Planted together, it can also create a loose hedge for your property.